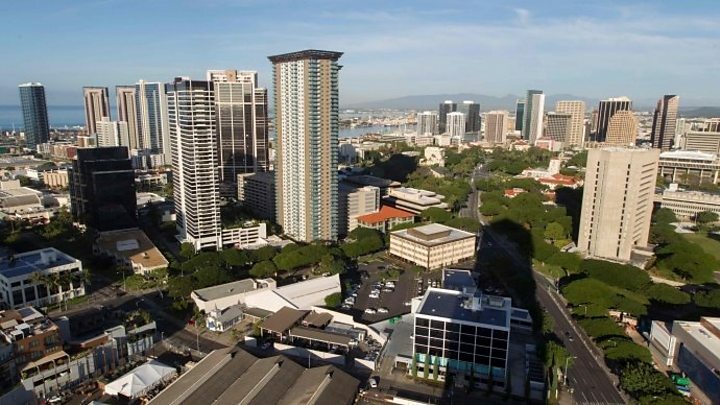 Hawaii has been pondering that question since December, when it restarted monthly tests of its nuclear attack siren for the first time since the end of the Cold War. The US state, which is about 7,400km (4,600 miles) from North Korea, has been increasingly on edge since President Trump and North Korea's Kim Jong-un began exchanging nuclear threats. 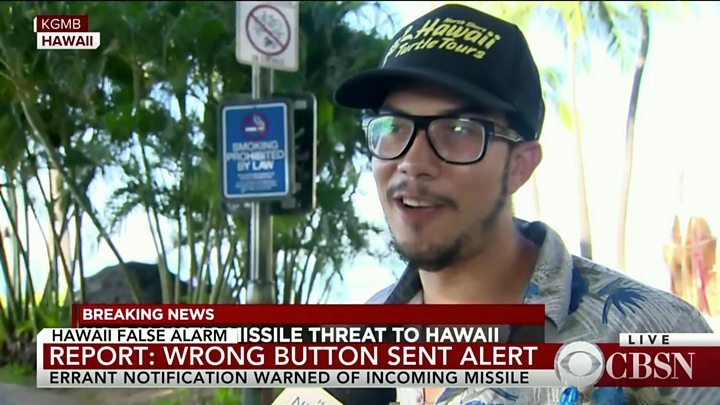 So if the siren goes, what are Hawaiians and visitors meant to do? Firstly, work out if it really is the missile siren. That signal uses a wavering tone, and is not to be confused with the steady-tone "attention alert" the state uses to warn of natural disasters like hurricanes or tsunamis. Secondly, don't try to run. You're safer inside the closest, most protective building - below ground if possible, somewhere like a concrete basement. The goal should be to put the maximum space between yourself and potential nuclear fallout. In Hawaii, social media footage even showed adults guiding children into storm drains. This is not considered safe because of the risk of drowning or dangerous gases being present. Estimates of how quickly a North Korean missile would hit vary, but last month the Honolulu Star-Advertiser gave an estimate of 20 minutes. Hawaii's emergency management agency put out a public service announcement in November that advised: "Get inside, stay inside, stay tuned." So you should also switch on the TV or radio to await information and further instructions. The US Department of Homeland Security points people to ready.gov - a website with guidance on surviving a whole range of crises - from an active shooter, to a volcano, to a pandemic. "An underground area such as a home or office building basement offers more protection than the first floor of a building." "The heavier and denser the materials - thick walls, concrete, bricks, books and earth - between you and the fallout particles, the better." "Find out from officials if any public buildings in your community have been designated as fallout shelters." "If your community has no designated fallout shelters, make a list of potential shelters near your home, workplace and school, such as basements, subways, tunnels..."
Build a disaster supplies kit with packaged food, water, a working radio and other essentials. Hawaii isn't the only place to make headlines over a emergency alert. On the small Pacific island of Guam, home to a strategic US airbase, residents feared the worst for 15 minutes in August 2017 when two radio stations mistakenly broadcast an urgent warning. How prepared are we for the impact of nuclear war? North Korea claims its nuclear weapons could strike the US territory at will - and the same goes for Japan and South Korea. Both have anti-missile defence systems and emergency alerts. South Korea's capital, Seoul, lies just 56km (35 miles) from the North Korean border, and national evacuation drills are held regularly. Japan has stepped up preparedness since North Korea repeatedly fired missiles over its territory in 2017, a move Prime Minister Shinzo Abe called an "unprecedented" threat. During a North Korean missile test in August, a safety warning urged citizens on Japan's northern island of Hokkaido to take shelter in "a sturdy building or basement". How long does Japan have to react to a North Korean missile? Are Pyongyang's missiles a risk to planes? In nationwide advice on how to survive a nuclear attack, the Japanese public were told that if a missile landed nearby, they should cover their mouths and noses and run away. Anyone indoors should stay away from windows to avoid injuries from shattered glass. A system called J-Alert exists to warn the Japanese of any incoming attack through TV, mobile phones, radio and outdoor loudspeakers. And on Hokkaido, officials have gone the extra mile: a colourful manga comic was recently published showing children hiding under their school desks, a jogger taking refuge in a public toilet, and farmers lying face down in the fields.